Hello, my name is Simon Riley and I am a Junior here at Mary Washington. I am here on the GI Bill after serving for a little over 2 years in the 2nd Battalion 28th Marines. I am getting an education so that I can pursue a lifelong dream of going to Law School and becoming an attorney. My wife and I got married several months after my return from the Pacific Theatre and we are looking to start a family together. There seem to be a lot of ideas floating around on all of the research blogs, the only thing I can think to add is that we should definitely use University of Mary Washington: A Centennial History 1908-2008. The book touches on every aspect of campus life, including classes. I think it would be a mistake to not utilize such a well-organized piece of historical literature. I also think it would be interesting to possibly take a look at some events that took place during the 1950’s that would be well known enough to be mentioned. 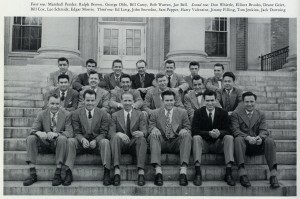 Needless to say, life at Mary Washington College during the 1940s was turned upside down by a mix of war and administrative merger with the University of Virginia. Everything that could go wrong seemed to go wrong during the 1940s, even mother nature took a shot at the College and Fredericksburg. The flood waters had a massively debilitating effect on the city and College. Fire started all over the city and, not surprisingly, the city’s electricity went out. “The disaster directly endangered Mary Washington students living in Cornell Hall, then a freshman dorm, located on Kenmore Avenue. Floodwaters rose completely above the basement rooms and lapped at the doors of the first-floor rooms, wreaking untold damage on furniture and personal belongings. 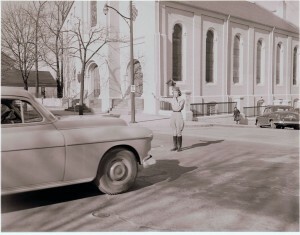 The residents were removed by the Fredericksburg rescue squad in boats and transported by ambulance to the Hill, where dormitory dwellers made room for the refugees.” Life may have been drier in the other dormitories but without running water and electricity throughout the University being dry was only a slight improvement. Food preparation proved to be difficult and due to the contamination of the water supply, all drinking water had to be boiled and all students had to be inoculated for typhoid. Sadly, I could not track down any photographs of the flood waters on Campus or pictures of the campus functioning without electricity and running water. You would think that the lack of electricity and proper running water would have a debilitating toll on the students but surprisingly it didn’t. The students were quick to respond to the disaster and volunteered to help the community in any way they could. Amazingly, “some two hundred students, organized and directed by Mrs. Bushnell served in canteens set up throughout the city to feed and care for the homeless; still others assisted with administering typhoid shots.” The Mary Washington College (MWC) Cavalry went the extra mile to assist the people of Fredericksburg by doing everything from keeping the city safe from looters to directing traffic like in the picture below this paragraph. I can only imagine how the classroom must have functioned during these hard times. For your typical lecture I doubt much would have changed as long as they had enough natural light but its very hard to know, perhaps some of my fellow researchers will find more in the other primary sources. 1. William B. Crawley, University of Mary Washington: A Centennial History, 1908-2008. Fredericksburg, VA: University of Mary Washington, 2008, 49-50. 2. Crawley, University of Mary Washington: A Centennial History, 1908-2008, 50. 3. Crawley, University of Mary Washington: A Centennial History, 1908-2008, 50-51. Out of the many developments at Mary Washington College that occurred in the 1940s the one that had the largest impact was when Mary Washington College underwent an administrative merger with the University of Virginia. The amount of prestige behind the University of Virginia catapulted Mary Washington College into the top tiers among women’s colleges in the state. 1. That the college be known as Mary Washington College of the University of Virginia. 3. That the board of visitors of the university be increased by the addition of four members. 4. That the president of the University of Virginia be the chancellor of Mary Washington College of the University of Virginia and its chief administrative officer, and that the title of the chief local administrative officer be that of president. The biggest impact of the new administrative merger with University of Virginia was the changes to the Mary Washington College curriculum. New degree requirements went into effect (for freshmen) in the Fall of 1945 along with the addition of a bachelor of arts and a bachelor of science degrees. Some of the directives placed on the College “specified that degree work no longer be offered in home economics, library science, or commerce courses such as stenography, typewriting, and office practice.” On top of that the Department of Education was to be eliminated and teacher-training courses were to be eliminated as well. This must have turned the classroom experience upside down. Everything about the curriculum and what the students at Mary Washington College could study was changed by the merger. But in a lot of ways this merger was an interesting step towards equality for the female student body at Mary Washington College. They had access to the same degrees that their male counterparts at the University of Virginia. Surprisingly I could not find any photos in the Digital Archives at UMW that showed any changes as a result of the administrative merger but you can just look into any classroom on campus today and you will see a result of this merger. 1. Crawley, William B. University of Mary Washington: A Centennial History, 1908-2008. Fredericksburg, VA: University of Mary Washington, 2008, 54. 2. Crawley, University of Mary Washington: A Centennial History, 1908-2008, 55. Overall and most importantly we are going to make the website as astatically pleasing. My classmates created some clever ways of using the photos. They decided we would build slide shows that would display classroom life, wartime efforts on campus, and side by side photos as well. We are planning to dedicate a page (maybe two) for our interviews. The other pages will consist of our research on how the war and other things affected the classroom experience during the 1940s. Finally we will be making an authors page where we all detail what we learned or found the most interesting about the whole process and the research itself. One of the things that stuck with me most through the entire reading is just how much our current social/welfare programs are reflected in the programs offered by the settlement houses, such as Hull House. The number of programs offered by the Hull House is rather staggering. The programs ranged from day care, to health care, to even poetry classes. The level of care and involvement that the settlement houses offered those in need was immense and impressive. They truly went the extra mile to improve the lives of people in need. Thank god that our congressional leaders can’t read, we have enough social programs to eat away at tax dollars; government-subsidized poetry classes is the last thing we need. Over the past week I have been researching the 1940s at Mary Washington College and it is astonishing just how quickly the College changed in the first couple years of the decade. The obvious reason for the changes that took place at Mary Washington College was the Japanese attack on Pearl Harbor on December 7th, 1941 which brought the U.S. into the Second World War. As the likelihood of war steadily grew in Asia and Europe throughout the 1930s interestingly, “most Mary Washington students tended to ignore it, their interests focused on more immediate matters, especially social and romantic ones.” This was not unusual for most Americans of the time but, needless to say, the willful ignorance of the American public and the student body of Mary Washington College was shattered by the Japanese attack on Pearl Harbor on December 7th, 1941. The outbreak of the Second World War had a surprisingly patriotic effect on the student body of Mary Washington College. But the student body was not the only part of the college that developed an overwhelming sense of patriotism. “Faculty as well as students were heavily involved in the war. Like the students, they contributed financial support; at one point 100 percent of faculty and staff were enrolled in the systematic purchase of war bonds. Beyond that, many participated more directly by taking leaves of absence to enlist in the military. At least fifteen male and five female faculty did so, with several of the women becoming officers.” The sheer number of faculty, male and female, who left to go fight in the war must have had a huge impact on the classroom experience at the College. To lose any faculty would have stressed any educational institution but to lose that many was probably especially taxing. With many men heading off to fight in the war, women had to step in to fill up the positions left open by men. This means that we can expect that there would have probably been an uptick in the number of female professors teaching classes that had been previously been taught by men. This change in roles served as a huge source of pride for women during and after the war. Below is a picture of the Mary Washington College Veterans sitting on the steps of Monroe Hall taken in 1948. 1. Crawley, William B. University of Mary Washington: A Centennial History, 1908-2008. Fredericksburg, VA: University of Mary Washington, 2008, 44. 2. Crawley, University of Mary Washington: A Centennial History, 1908-2008, 47. I am currently charged with the monumental task of compiling research on the University of Mary Washington during the 1940s. I am sharing the task of perusing photographs and compiling information from interviews with others in my group; On top of that I am also going over University of Mary Washington: A Centennial History, 1908-2008. There are a massive number of photos in the Centennial Collection, almost 150 alone from the 1940s. 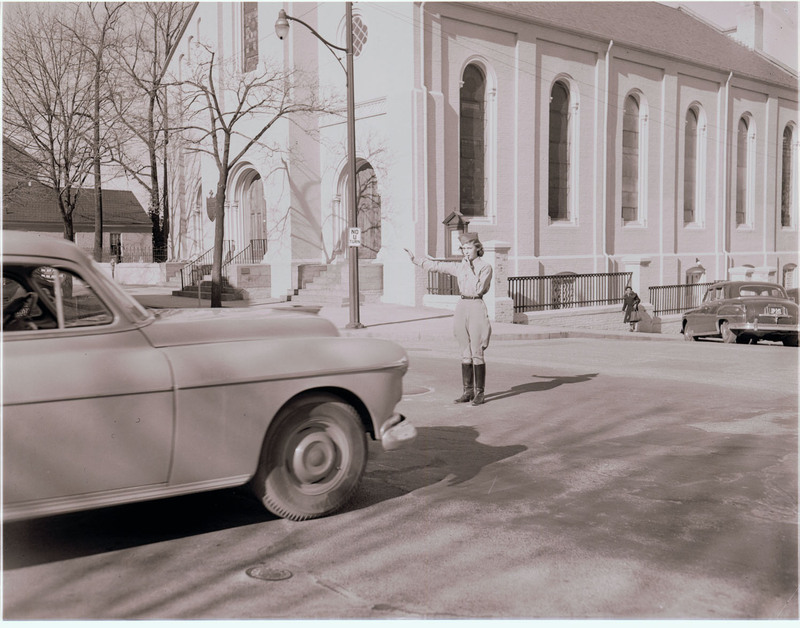 So many of these photographs give us a peek at the past and how life on campus was over six decades ago. The photos are all in black and white but are of a surprisingly good quality. These photo’s allow us a physical glance into the classrooms and from these we can get a sense of what the students are experiencing. University of Mary Washington: A Centennial History, 1908-2008 by William B. Crawley Jr. is one of the most illuminating pieces of literature that can be found about the University of Mary Washington. This narrative spans 100 years of history at the University and gives us, as history scholars, an invaluable look into the past of the University of Mary Washington. The book itself is brand-spanking-new, courtesy of the Department History and American Studies. The book should prove insanely useful to highlight certain issues of the decade in question and we can see how certain events like international conflicts, natural disasters, and an ever-changing society. I have just started my research and I can already tell that the 1940s was probably one of the most interesting times for someone to be working, learning, or living at Mary Washington College. It is quite the honor to be researching one of America’s greatest generations of women. Cheers. Hello all. My name is John Crowell-Mackie, and this is the research blog I will be using to share all of the interesting information that I collect on U.S. Women’s History in the 1940’s. Taken by Tarin S.C.M. 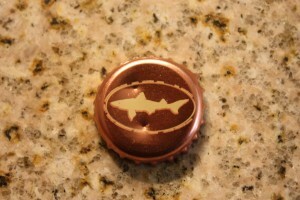 Logo is the property of Dogfish Head Craft Brewery Inc.